Hall-effect-based measurement of highly dynamic currents under harsh environmental conditions: the LEM-sensor packages are optimized for connection to our AD4 ECAT modules. 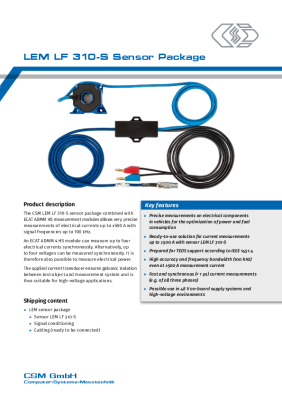 The LEM sensor packages allow fast and synchronous current measurements. Highly dynamic current measurements (e.g., on all three phases on the inverter, as well) with a cut-off frequency of up to 200 kHz in a measurement range of up to ±1,250 A can be carried out with this fully-wired sensor module along with the EtherCAT®-based measurement module AD4 ECAT series. Besides current measurement, the power input and efficiency of individual components and their response over time are also critically important. Voltages at drive and power-supply components can be directly measured up to a ±90 V measurement range with the AD4 ECAT measurement modules, as well. A synchronous measurement of all channels can be performed with the synchronization mechanism Distributed Clocks supported by the ECAT module – this is a must for power measurements. At the heart of the system is a special Hall sensor from LEM. This sensor has a high cut-off frequency and it operates very accurately in a large temperature range. Sensors with this power rating require an individually adapted auxiliary supply. The sensor system is pre-wired, you can install it with plug&play and it’s ready to go straightaway. The sensor has a DC/DC converter and a suitable integrated shunt so that an analog output proportional to the measured current is produced and you can be sure that the deployed sensor is operating properly. The HV Breakout Modules (BM) have been specifically designed for safe measurement applications on cables carrying high voltage. Current and voltage are evaluated and the power calculated online in the module. XCP-Gateway is the interface between the data acquisition software (e. g. vMeasure, CANape®, INCA®, Vision® ...) and the EtherCAT® measurement modules from CSM. It includes an EtherCAT® master and an XCP-on-Ethernet slave.